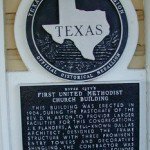 The history of First United Methodist in Royse City dates back to September 1, 1884, when a revival meeting was held by the Miller brothers, one of which was a Baptist. The Elm Grove Church was organized and the Rev. F.O. Miller became the pastor pro-tem of the church until May 1885, when Rev. J.B. Minnis became pastor. In October 1887 in the old school house which sat where Cavitts Gin was located (west end of Lamar St.), there was a group that met and organized the FIRST Methodist congregation of Royse City, with Rev. James McDugald as pastor. There were three denominations, Baptist, Christian and Methodist, who all worshipped in the old school building, alternately. The Methodists were the first to obtain their own building. 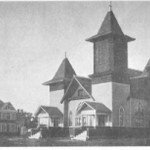 A few months later the Christian Church was built, followed by the Baptist Church in 1894. 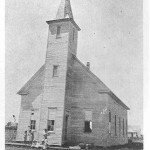 The construction of the church (the first church built in Royse City) was rushed and the paper donated by W.H. Adams in order that the church could be completed in time for his wedding. He married Annahlee Jones on July 8, 1891. The ceremony was performed by Rev. J.Marvin McKee; this being the first service in the church. The pioneer members gave generously of their time and talents and by 1904 this church building was too small and the second church was built at the present location. The Rev. D. H. Aston was pastor. W. Oscar McGraw was the builder. We still have the old plans Mr. McGraw used in building the church. This was a much larger church building than the first one, and today- over a century later- it is still being used as our present church building. 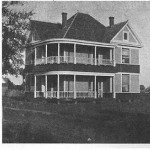 The first parsonage was located at Old Fate, which was located near the intersection of Highway 66 and F.M. 552. The reason for it being located there was that Fate was headquarters for the circuit riding ministers who served the church, and this was more the center of the circuit. The first parsonage built in Royse City was built in 1904 from material of the old church building. It was located on the south side of the church lot now cut off by the highway. This building was moved when the highway came through at a cost of $250.00. It served our parsonage families until 1955 when a newer parsonage was built at a cost of $9,555.00 by the firm of J.A. Ballard and W.R. Hudson, Hunt County, Texas. wedding in this church was Edna Terrell and Tim Miller. funeral service in this church was for Alpha Cline who died December 18, 1904. Sunday School Superintendent was Bob Terrell. communion service was a tall silver pitcher, two goblets, and two plates. Presented to “The M.E. Church of Royse City: by James Paulk, S.T. Jones, W.H. Adams, G. W. Neeland and H. T.
The FIRST Methodist church building to be built in Royse City in 1890. It was located on what is now Church Street, across from the North entrance of the present sanctuary. Our present church building built in 1904. Builder was W. Oscar McGraw. The old parsonage can be seen to the left where Hwy 66 now runs. The first parsonage in Royse City built in 1904 using the lumber from the old church building. Members felt the lumber was too sacred to be so desecrated, as to be used for common buildings, so must be incorporated into use for the new church. Our church, built in 1904, is a perfect style of Western Gothic architecture. It was used by our pioneer fathers to copy the Gothic Cathedrals in Europe, built of wood instead of stone, in the 1830’s and early 1920’s. They had no flying buttress and some had three square towers, some two, and some one. The three tower churches are TRINITY WESTERN GOTHIC (which is what ours is). Each tower symbolizes the trinity, God the Father, God the Son and God the Holy Spirit. Atop the towers are crosses, with four symbols which are symbolic of the four gospels. The towers are square with each side standing for a gospel. The bell tower, which is over ninety feet high, holds a pyramid with the four triangles pointing to God the Father, Son, and Holy Spirit as revealed in the four gospels. The columns on the three porches are wooden and Western Corinthian in keeping with Gothic tradition. The sanctuary, with the petition up, takes on the form of a cross. The nave (central division of the church in which the congregation is seated) runs east and west, with the chancel at the east end. This is true to Gothic tradition as well. The priceless arched stained glass windows fit in with the Gothic form of architecture. The two sacred art glass reproductions are Bernard Plockhorst’s “The Good Shepherd” and Rembrandt’s “The Resurrection”. The arched stained glass windows symbolize the praying hands uplifted to Christ. The Western Gothic churches had a lot of art glass work, whereas the Pure Gothic had more rose windows and arched windows on the side and little art. This Trinity Western Gothic style lends grace and beauty to our church, which we are proud of. ﻿Our stained glass windows were given as memorials by loved ones in memory of family, friends, members, pastors, etc. Our two large windows are in memory of former pastors – Rev. J. Marvin McKee, pastor when the first church was built, the other in memory of Rev. Dudley T. Brown, given by his wife. At the time of installation these windows cost $150.00. The smaller ones have the names of persons they were given in memory of. To this day, memorial gifts given in the name of a loved one are used for the maintenance of these priceless windows in our church. In 1978 our church was recorded as a Texas Historic Landmark with the Texas Historical Commission.